Apple's had some bold words for its competitors today. Once again, Apple has shown its desire to be your go-to for everything you do in your life. During its Worldwide Developers Conference keynote this morning, the iPhone maker talked up software updates, services and new functionalities aimed at making several of its competitors’ offerings redundant. Here are the things Apple’s trying to take out with new stuff at WWDC 2015. Apple Watch is getting a nightstand mode. During its presentation of the new features headed for watchOS 2, Apple revealed “Nightstand Mode,” a standby setting for the Apple Watch that turns it into a tiny clock while it’s sitting on its side and charging overnight. It displays the time in a landscape mode and lets you set alarms, with the Digital Crown and side button serving as snooze and off buttons. This doesn’t mean that all the Apple Watch stands out there are now useless, but it will mean that designers might want to focus more on horizontal orientations than vertical ones. And if you currently use a dedicated alarm clock instead of your phone, this may very well put it out of business. If Apple’s Newsstand-replacing News app looked familiar, what with its content curation, social features and slick-as-hell presentation, here’s why: It’s basically Flipboard. I’ve never used Flipboard, myself, but I’ll be interested in checking out the News app, especially if it’s better than the admittedly crappy Newsstand we’re currently stuck with. Given the similarities, Apple’s either hoping to block new adopters of Flipboard, or just keep its current Newsstand users from defecting to the currently better option. It’s no surprise that Apple would love to see retailer-run mobile payment system CurrentC go away, and the rival service is actually doing most of that work all by itself with a failure to establish a foothold or even produce the app that will drive it. 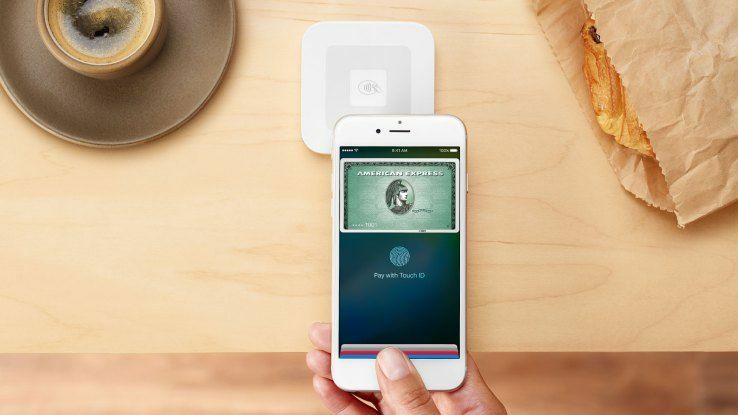 Apple Pay’s expansion to include 1 million retailers (by its own WWDC estimates), the more populist solution of partnering with Square to allow anyone using that system to accept payment via iPhone and Apple Watch, cement Cupertino’s position so securely that should CurrentC ever properly come out, it’ll find itself as the only person at its own party. Virtual assistants like Microsoft’s Cortana and Google Now are iterations of Apple’s Siri, but Apple is iterating right back with features it calls “Proactive Assistant” and “deep linking.” These features will work together in iOS 9 to provide information, manage your appointments, and even check the traffic for you to make sure you reach appointments on time. It’ll even bring up music for you as soon as you plug in your headphones. Just try not to fall in love with it, Her-style. That would just be too weird. 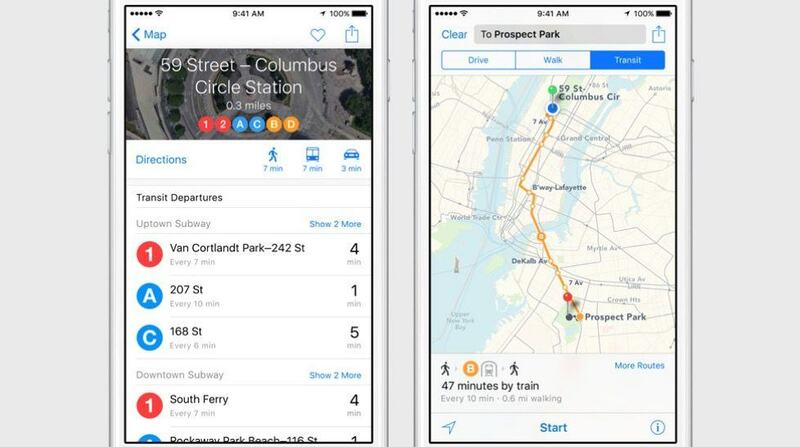 Transit directions are coming to Maps in iOS 9. 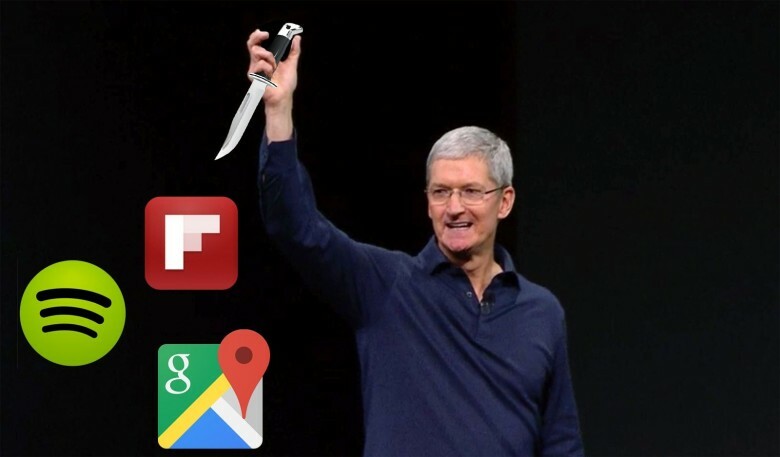 While we’re talking about Google, Apple announced updates coming to its native Maps app that are straight out of Google’s navigation book. Specifically, the upcoming inclusion of public transit for carless iPhone owners is something Google already does. Apple’s Maps will go one further, however: Not only will it tell you which bus or train to take and integrate your walking time into your ETA, but it will also let you know which merchants along your route will accept Apple Pay. I recently bought a nice, super-slim wallet, and I like it a lot. And it’s nice to know that Apple is now doing everything in its power to make it redundant. Apple announced Wallet, an app that will replace Passbook and will contain basically everything that I try to have with me at all times. In addition to the usual Apple Pay and tickets, Wallet will expand to include loyalty cards to save you having to punch in your phone number every time you go to Walgreens because your new, super-slim wallet doesn’t have any room for all those things. In fact, the one thing Wallet can’t hold is your driver’s license or state-issued I.D., but I wouldn’t rule Apple out on that just yet. Even though we’re not entirely clear on specifically how Apple Music will work, we do know a few things: It’s a three-pronged service composed of a music store, a social platform and a radio station. And if it catches on with those three services, it’s bad news for the competitors. I wasn’t too impressed with Apple Music’s presentation at the keynote, but maybe I just got bored with Eddie Cue’s insistence that we sit and listen to all his favorite songs. Hopefully, the finished product will be more engaging and personable than its debut. And really, that wouldn’t be very difficult. iTunes Match is a goner. When you join Apple Music, your personal music library gets scanned and any tracks not in Apple’s massive collection will get sucked automatically into iCLoud. It’s basically baking iTunes Match into Apple Music.